I just had to use this mega seeet image how can you not love it! I'm hoping that this will ease off but for the next month it will be as bad ! Such a sweet card. Love this image and your coloring is just perfect! Adorable ! 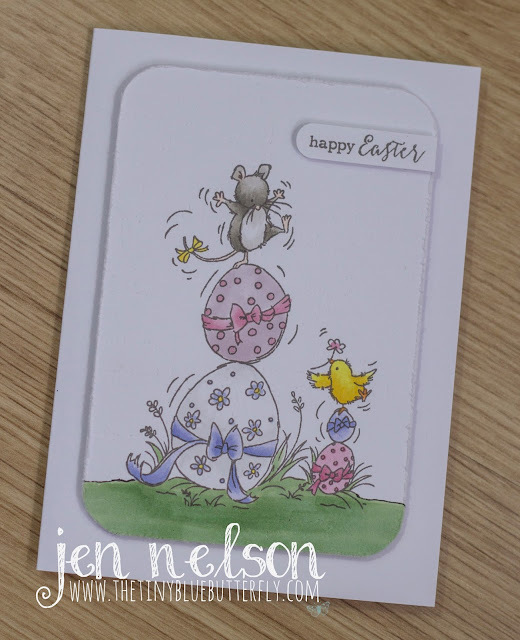 You're totally right, we can only love this cute Easter scene! And your choice of colours is just perfect ! I particularly love this little mouse ! I hope you will quickly find a normal rhythm at work! Have a nice WE and thanks for sharing and inspiring ! Super sweet Easter card Jen. Love the whole scene. The colours are fabulous. Gabby card...such a cute image and great colouring. I hope work eases off for you soon and you can relax in your craft room again. Sorry Jen...the above should read fabby not gabby card!